Being More Conditioned by The Culture Than By the Bible. To Be Labeled "Heresy Hunters"
Or Found Guilty of 'Touching' the Lord's Anointed. And Are Commanded to "Love"
There are numerous reasons so many modern day Christians are deceived. Too many of them believe they should be "united", and that they have been commanded to "love". Most do not want to be accused of quenching the spirit, labeled "heresy hunters" or found guilty of 'touching' the Lord's anointed etc. etc. Besides which, Christians seem to be very addicted to 'spiritual highs'. However, the reason deception is so rampant in the church can be primarily attributed to just one underlying fact ... The vast majority of Christians today are Biblically illiterate. For the most part, entertainment oriented, anti-intellectual and superficial contemporary American culture is geared towards dissuading us from using our minds. Tragically, this trend has carried over into the church that is giving less and less heed to in-depth Biblical study that leads to right doctrine, but prefers their religion in pre-digested, convenient little packages. Our theology is often confined to catch phrases, and cutesy little daily devotions preferably well sprinkled with inspirational stories and jokes. We have substituted entertainment and emotions for solid Bible study. It is no wonder that books like "Experiencing God" are so much more popular than books that bear titles like "Knowing God". The more Biblically illiterate a Christian is, the easier it is for him or her to be influenced or even brainwashed by the plethora of anti-Biblical beliefs prevalent in the church today. Even worse, although salvation is the warp and weft of the Bible, the topic around which the entire book rotates, well meaning Christians who, in answer to the life and death question of what a person must do to be saved, will pull out yet another cliché from their collection and tell them that they have to ask Jesus into their heart. In fact, you will find this phrase liberally sprinkled through the Christian world... found in Christian tracts, preached from pulpits, and taught by evangelists. However, if you had never read any Christian material, talked to another Christian, or attended a Christian service or evangelistic crusade, but had simply read the Bible from cover to cover a dozen or so times, you would never have known that you had to ask Jesus into your heart to be saved.... Why? Quite simply because it isn't there. God directed believers to proclaim the Gospel to others but one can be reasonably sure that doing so in a vague, non-Biblical way that not only obscures, but actually alters the message, is not exactly what He had in mind. Anyone, be they young or old, can ask Jesus into their hearts without having the faintest idea of what it is they are saved from, that repentance is an absolute requirements for forgiveness, and the fact that salvations actually demands something from them. How exactly then can this popular phrase be construed as the Gospel? Although Paul was very clear that the wolves would arise from among the flock, it seems that all too many believers seem to be very disinclined to accept that the author of a Christian book, magazine, article, blog etc. may be one of the wolves that he spoke about. That so many 'wonderful' ministries are rotten at their core, that slick magazines like Charisma could be peddling deception, and that Christian bookstores sell an enormous amount of material that can be termed anything but Christian, including books which stem from the occult. Considering the astronomical stakes, it is not without very good reason that the New Testament directs all Christians to exercise discernment ..
Not only are our senses so dangerously jaded by the endless parade of immorality, violence, and materialism, that little shocks or even causes us to blush, but we imitate the world in its adulation of celebrities. Well-known evangelicals and so-called "Christian" musicians are treated like rock stars and given total allegiance. We hang on to every word that comes out of their mouths, buy their books, and pay to hear them speak or go to their concerts. We are a community without a smidgen of Biblical discernment, to say nothing of a total lack of common sense. Or any of the other derogatory terms given Christians who insist on checking everything by the Scriptures. One of the four most dangerous things any Christian can do is believe the politically correct, liberal view that we, as Christians, are not to judge anything, or anyone. "Judge Not" is the one Bible verse that most people love to quote however, few seem to realize that this is not a stand alone statement that Jesus pulled out of thin air, then went off to try his hand at fishing for his lunch on the Sea of Tiberias, saying no more on the matter. In fact it has been terribly wrested from it's context. (Also See Context is Crucial). Worse, many who have some doubts about some movement or practice are cowed by the possibility of "quenching" the Holy Spirit, which comes from the last chapter of Paul's first letter to the Thessalonians. In closing, Paul gave the Thessalonians a number of instructions, which included things like living in peace with one another, admonishing the unruly, encouraging the fainthearted, helping the weak, and being patient with everyone (( Thessalonians 5:11-22). In verse 19 he tells them not to quench the Spirit, an instruction which has been taken completely out of context by false teachers, who use it to dissuade Christians from questioning what they preach and teach. However, when Paul's instruction not to quench the Spirit is read in context, he was actually telling his readers to develop Biblical discernment. It would be difficult to find a charismatic/evangelical service/program/tract/book that is not liberally sprinkled with the word 'Anointed', which has arguably become the most overused, overworked, misunderstood, and misinterpreted, term in the Pentecostal and Charismatic arenas. The warning not to 'touch the Lord's anointed' is part of the arsenal of numerous Charismatic celebrities today. It is a stern warning directed at anyone who opposes their unscriptural doctrines and practices. And, sadly these warnings are heeded by their devotees unwilling to risk God's displeasure by 'touching' one of His favoured. One concern many Christians have with those who insist on adherence to doctrine, is that it tends to divide Christians. And, of course, this is seen as the ultimate sin by a pluralistic society that bends over backward to accommodate every belief, regardless of how illogical, false, or simply stupid, it may be. Paul told the Thessalonians that they were to admonish the "unruly", to the point that they were not to be associated with anyone who would not obey the instructions in his letter..
And there is more - plenty more. See Fraternizing With The Enemy. And Are Commanded to "Love". The problem is that love is often confused with sentimentalism and feelings. But Biblical love, which cannot be divorced from truth, looks for the highest good of the other person. This cannot be accomplished by agreeing with false teachings which, in the end, will destroy those who believe and follow these teachings. True love is committed to the truth, and no one can claim to love if they are not concerned about truth. 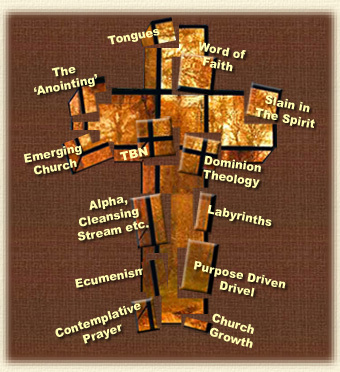 While their counterparts outside the church are focused on raising their level of consciousness and attaining enlightenment and self-actualization through an assortments of spiritual practices, modern Christians are trying to 'find God' or enhance their experience of Jesus by highly questionable means like contemplative prayer, meditation, labyrinths, yoga etc. The Physical Manifestations Of A Kundalini Awakening: For thousands of years Hindu gurus have connected with a cosmic power which, though demonic in origin, is very real. As devotees reach a certain spiritual elevation they begin to shake, jerk, or hop or squirm uncontrollably, sometimes breaking into uncontrolled animal noises or laughter as they reach an ecstatic high. In Hinduism these manifestations are called 'Kriyas', but are referred to as "Slain in the Spirit" in Christian circles. Christian "gurus" think they are hot stuff running around screaming "Bam" and "Fire", little realizing that they are literally building sand castles in the devil's playground. The Sanskrit word Shaktipat, is derived from two separate words.. Shakti (above) and Paat (to descend, fall, tumble, to cause to fall down, to cast down etc.). It refers to the ancient practice wherein a Hindu "holy man", guru, or spiritual teacher confers a form of spiritual 'power' or awakening on a disciple/student, which is called raising Kundalini. Although not exclusively, this is often accomplished by a touch to the ajna chakra, or the disciple's third eye... said to be located in the middle of the forehead.